It's another Fitness Friday. Sandy of God Speaks Today, Sarah of All Pain, No Gain and I decided to each write a post on the same theme. Our theme for this week is ...proper body image. As women, we're constantly bombarded with messages on TV, billboards, and magazines about how we "should" look. It's so sad because we're seeing more eating disorders in young girls than ever before. It's unrealistic and unhealthy to look like many of the models that they try to emulate. I posted this video earlier this year but if you missed it, it's really worth watching. If you think that models look so perfect, you need to take a few minutes to watch this. Have you heard of Photoshop? If you have a little cellulite, that can easily be erased. A few wrinkles around your eyes? Instantly gone like magic. And we wonder why women have poor body images? Should we take care of our bodies? I believe we should. But for the right reasons. If you're a Christian, your body is a temple of the Holy Spirit. If you're overweight, always tired and sluggish it can be hard to be about the work that you've been called to do. Personally, when I feel good and have energy, I'm much more eager to reach out to others. But our body structures will be different. Some people have a larger bone structure and will never be a size 4 or 6. Another woman might have a smaller bone structure. We're each created differently. I believe the important thing is to strive for a healthy lifestyle. Eating a variety of foods including many water rich foods like fruits and vegetables is healthy and lower in calories. Foods like candy,cookies and chips may taste great but are empty calories with no nutritional value. And believe me, a handful has LOTS of calories. Jesus walked everywhere He went except for the occasional boat trip. The disciples didn't have to be concerned about getting on a treadmill. They got lots of exercise from ...plain old walking. Today we drive our cars everywhere. And of course, we have to get the parking spot closest because who wants to walk that far? We sit at our computers or watch TV and don't move around much. Kids can sit for hours playing video games. We need to get up and start moving more. 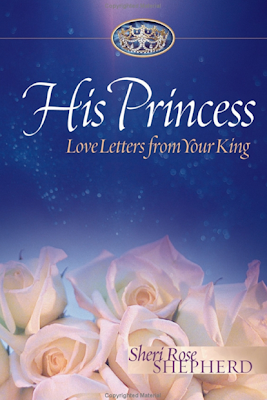 I've been reading a love letter each day from a book called His Princess: Love Letters from your King by Sheri Rose Shepherd. Listen to this letter on beauty. "Your real beauty is a work of art - hand carved by Me. I have given you beautiful lips to speak words of life, beautiful eyes to see Me in everything, beautiful hands to help those in need, and a beautiful face to reflect My love to the world. I know you don't see yourself the way I do because you compare yourself to beauty idols that will soon be forgotten. I will work wonders that will radiate true beauty from within. And when my work is completed, your character will show off My craftsmanship, and your beauty marks will be remembered by all that were loved by you. Love, Your Radiant King"
Isn't that an awesome way to consider the beauty of each one of us in God's eyes? If we would only see ourselves as He sees us ...unique but greatly loved. So, let's keep things in perspective. 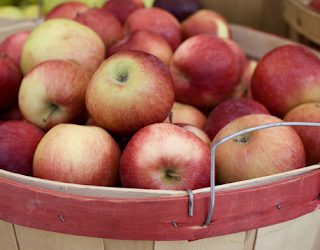 Take a walk, chose an apple (from the good tree) instead of those chips and remember that ...God loves you. Hi Sis, I'm not back online yet but came on to respond to someone and so I decided to visit you and Sarah as I saw your themes on my dashboard and it's an area that SO many woman struggle with -- BODY IMAGE! Your words: "If you're a Christian, your body is a temple of the Holy Spirit." That's the key for me. I haven't had the experience (at my smallest weight or highest weight) of viewing myself through the eyes of magazines, models, etc. as I really was raised the opposite of that thinking by my Grandma who was very petite until the day she went to the LORD but she always told me that I am not defined by my body or beauty but by the fact that I was a child of GOD. Boy did that help me to avoid the body image trap or jealousy of other women. However, I know countless women over the years who struggle with this and I've ministered to many. It breaks my heart to see the pain they go through because poor body image brings on inappropriate expectations of yourself and a host of other concerns like competitiveness, low self image, feeling insecure, unloved and not worthy etc. So much I could share but I will say thank you for sharing this with us and for pointing out that we are all different. Our bone structures are different but also our cultures, ages and heights. As a 5'3" (no height) black woman I am larger boned and was never designed to carry a size 4 or 6 but I was never designed to carry the 3x I used to be as well. The key is to find the BALANCE. I continue my journey to get into the size that's healthy for me which would be a 12 and I'll keep pressing forward with the LORD as my Helper as I make balanced decisions day by day for myself. Good days and difficult days but that's all a part of the journey. Love you girl. Talk Mon when I'm back online. That video is awesome...and shocking. I'll never look at a magazine cover the same way again. Thank you for sharing this wonderful post dear, love you. This is a great post, Debbie. I don't like to wear lots of makeup but I like to take good care of my skin. When I see the flawless skin on older women I have to admit I wonder how is that possible and I have to remind myself...it's possible with an airbrush. Being beautiful to Jesus is what matters and that is total beauty on the inside...it will radiate to the outside. Blessings to you. I'm praying for you. I had never seen that video before. It's so true. I remember after having both of my kids camparing myself to celebrities who had children at the same time. Britney Spears and Angelina Jolie - Like I will EVER look like either one of them. I guess I'm just so disappointed in myself for getting so sucked into all the meaningless "body image" stuff. This weeks posts mean alot. I didn't know you were posting, so I will be guiding people your way now! I guessed I missed the video the first time - very eye opening. Apparently, even the models aren't good enough for the final layout. How could I ever measure up? There is so much to be said (and has been said) about this subject. "the King." He sees our real beauty, and that is what we should all strive for. When the King looks at you, I think He sees a beautiful woman.